TRENTON – Two of Mercer County Community College’s top students were honored May 5, joining the brightest and best from community colleges across the state during the New Jersey Council of Community College’s (NJCCC) Phi Theta Kappa (PTK) Day at the Wyndham Garden Hotel in Trenton, when members of the PTK Academic All-Star team were announced. Representing MCCC was Cody Willever of Columbus, N.J., and Radoslaw Dlugowski of Lawrenceville, selected based on grade point average, outstanding community service, leadership abilities, and recommendations from instructors. MCCC PTK advisor Dr. Jinrong Huang and MCCC President Dr. Jianping Wang, with students Radoslaw Dlugowski and Cody Willever and PTK advisor Jennifer Cook during the NJ Council of County Colleges' PTK Day. Willever, a Nursing student who will graduate in the fall of 2016, said he looks forward to earning his degree and then passing the exam to receive his nursing certification. He said he wants to gain some experience in the field before pursuing his bachelor’s and master’s degrees in Nursing, with the ultimate goal of becoming a nurse practitioner. He credits Mercer with guiding him toward his chosen career path. Then he added: “Not to mention cool advisors to take care of me,” noting MCCC PTK advisors Jingrong Huang and Jennifer Cook. Dlugowski, a Physics major, has been accepted to Purdue University for the fall, where he will pursue a degree in Nuclear Engineering. The son of immigrant parents and a first-generation college student, Dlugowski said he first enrolled at Mercer primarily as an affordable option to a four-year college. But he adds that he graduates feeling he received a high-quality education. 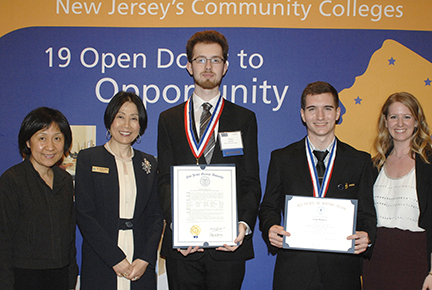 Each year the NJCCC hosts the event to recognize the state’s 40 best community college students as members of the New Jersey All-State Academic Team. The event is sponsored by PTK, the international honor society for community colleges, the Coca-Cola Foundation, and the New Jersey Education Association.